There is no question that Apple's wireless Bluetooth AirPods have been a big hit. Over the course of a day, you will often run into several people wearing the accessory. And this success has led other companies to release their own wireless ear buds. In fact, back in November research firm Gartner forecast that ear worn devices will be the top wearable product by 2022 with 158.43 million units shipped. Smartwatches currently lead the wearables category. However, some news released today by The Atlanta Journal-Constitution says that a number of scientists agree that AirPods and other ear worn devices are a cancer risk. 250 scientists have signed a United Nations (UN) and World Health Organization (WHO) petition making that claim. The Bluetooth technology used to provide connectivity between a handset and ear worn devices like the AirPods are being blamed for the cancer risk. The technology uses electromagnetic frequency (EMF) radio waves to transmit data, and its use so close to a user's inner skull is considered dangerous. The International Agency for Research on Cancer recently said that EMF waves could be carcinogenic to humans. High levels of exposure to EMF waves can also cause neurological issues and DNA damage. While high levels of EMF waves can cause burns and impact cell-growth in humans, it isn't clear what can result with prolonged exposure to the low amount of EMF waves produced by devices like the AirPods. And while the WHO has guidelines on the amount of EMF that devices can safely expose a user to, the scientists who signed the petition say that these guidelines are not tough enough to prevent the radio waves from causing illnesses in humans. The petition signed by the scientists notes that children are more vulnerable to the effects of EMF. "Based upon peer-reviewed, published research, we have serious concerns regarding the ubiquitous and increasing exposure to EMF generated by electric and wireless devices. Numerous recent scientific publications have shown that EMF affects living organisms at levels well below most international and national guidelines. "-Scientists' petition to the UN and WHO"
Samsung recently launched its wireless Bluetooth Samsung Galaxy Buds, which the company gave away to many who pre-ordered one of its new Galaxy S10 phones. And Apple is expected to unveil the AirPods 2 during its March 25th press event. First of all.. samsung released icon x ear buds before airpods. Also, what is "Galaxy 10 phones"? You guys really need to review your own work. Well what do expect iphone arena to get as writers when they don’t get paid? Only narcissistic comic book reading lazy no job having non intelligent kids would apply. I'd guess this would envelop any bluetooth headset. There's probably less than an inch difference between where headphones and in ear pods are against the skull. Dunno. Love my bt headphones, though, never got into earphones. I've a serious question no joke - is Wi-Fi safe?????? Thank you, Alan, for this article. I hope to hear some follow up on this topic as well as others like this. Lol, I haven't even opened my TWS package yet. "And this success has led other companies, like Samsung, to release their own wireless ear buds" And thus history was rewritten again. Because it was Samsung who gave Apple ideas. Who cares, nowadays you get cancer from anything what you do. beer is still safe ?...right ? Hard to say when it comes to beer, but hard alcohol... possibly. Read an article a while back where there was talk of putting warning labels on booze similar to cigs. I recently bought an EMF meter and I was shocked when I measured my Sony XM2, the radiation was far stronger than I thought it would be, considering the Bluetooth was supposed to have low radiation. It's as high as holding your phone on your ear and transmitting 3G data continuously (4G is stronger). I then measured my 6 year old Bluetooth speaker and it had almost 10 times lower radiation. It looks like the newer generation Bluetooth boosted the signal far too much, so it's not safe any more for having it in a device that's close to your head. A story like this had to come out, but it won't be enough to sway/force OEM's to bring back the headphone jack...or prevent consumers from using their beloved Bluetooth earbuds. It's like microwave ovens - we all know it's unhealthy to eat the food that gets cooked in them, but does that stop most people from using them? Nope. Sacrifice health and flavor for convenience...yup. Bring back the headphone jack . What doesn't cause cancer these days? Hell, breating, or eating French Fries can cause cancer. I'm using my AirPods, and iconix everyday. Is what it is. Getting daily exercise, is one way to ward off cancer...health is wealth. Yeah, I don't want the 3.5jack going anywhere. "There is no question that Apple's wireless Bluetooth AirPods have been a big hit. Over the course of a day, you will often run into several people wearing the accessory. And this success has led other companies, like Samsung, to release their own wireless ear buds" Really Alan, lol Here is some fact checking for you. 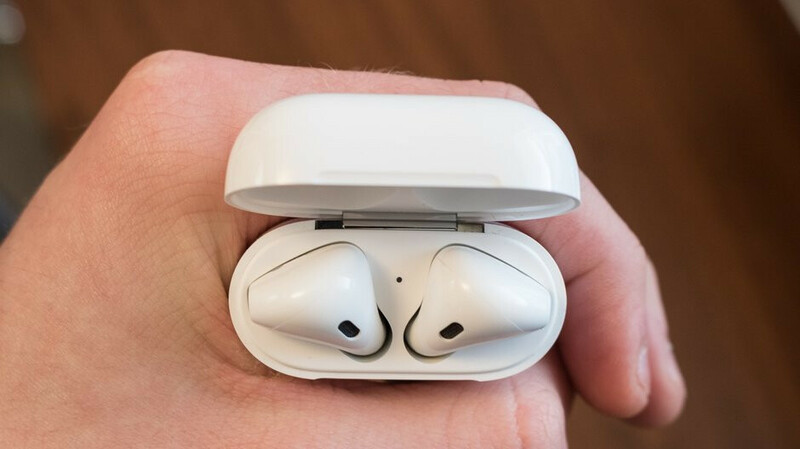 "Samsung launched the first-generation Gear IconX on July 15, "AirPods were introduced on September 7, 2016 alongside the iPhone 7 and Apple Watch Series 2. Apple originally planned to release the AirPods in late October, but the company delayed the release date. On December 13, 2016, Apple released the AirPods to be ordered online"
These scientists are a joke. They are probably paid by some companies. Their petition is just based on assumptions & everybody can make any assumptions. That's ok if you get cancer from the AirPods, the Apple watch will save your life.